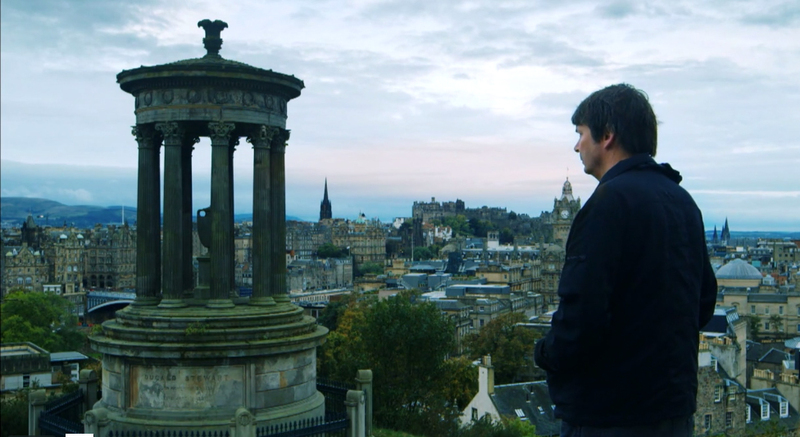 Crime novelist Ian Rankin looks at the city of Edinburgh. Popular Scottish crime novelist Ian Rankin shares stories about his early days, (he wrote 16 books before he had a bestseller – such persistence!) talks about his creation police inspector John Rebus and takes us on a tour of “hidden Edinburgh” where there are “always new crime scenes to be discovered.” He says Edinburgh has all of the amenities of a large city while being conveniently compact. And it’s really the main character of his books, more than Rebus himself. 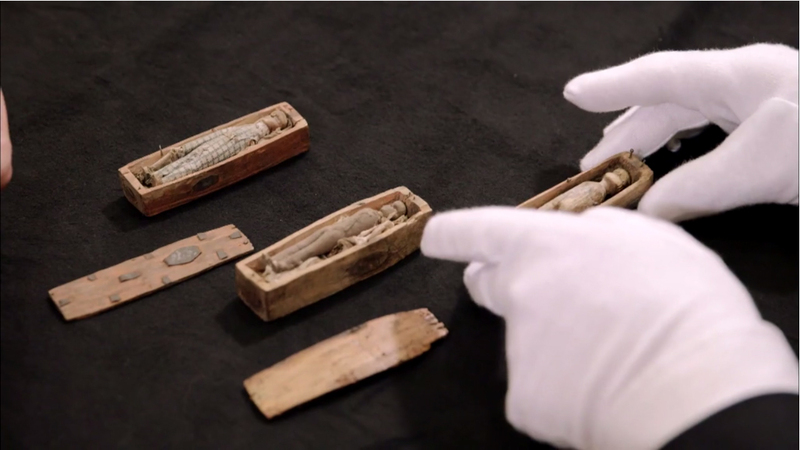 Tiny wooden dolls inisde tiny wooden coffins might be connected to notorious Edinburgh grave robbers and murderers Burke and Hare. This tour includes a visit to an underground street, several graveyards, the Scottish Parliament, tales of cannibalism and bodysnatchers, the murderers Burke and Hare, the continuing mystery of 17 tiny coffins that date back to the 1830s, and the story of Deacon Brodie, the Edinburgh city councillor and cabinet-maker who was the inspiration for Robert Louis Stevenson’s novel The Strange Case of Dr. Jekyll and Mr. Hyde. (Stevenson set his story in London, though.) Sherlock Holmes author Arthur Conon Doyle was from Edinburgh, too, and he also set most of his stories in London. Rankin reveals that in the first few Rebus books he set events in unnamed, fictional streets. Later he decided he might as well use real places, so he had Rebus working in a real police station, drinking in real pubs and living in the neighbourhood Rankin had lived in while attending university. 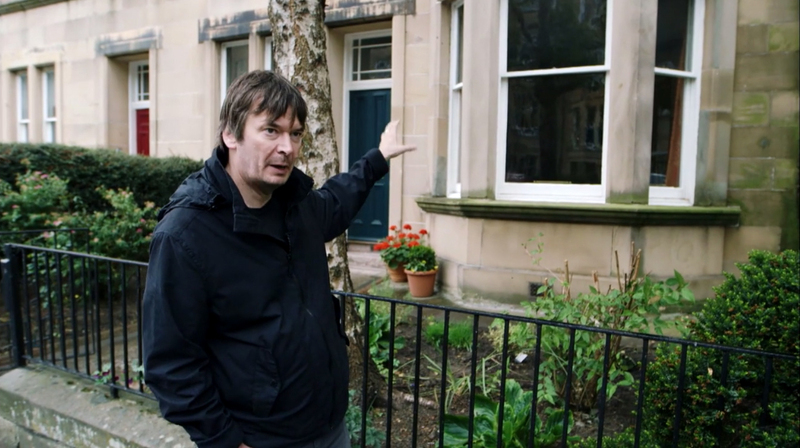 “That was my bedroom window,” says writer Ian Rankin, pointing at the apartment he lived in during his student days. He decided that his character, police inspector John Rebus, would live across the street. Actor and historian Colin Brown runs Rebustours.com, which gives tourists a chance to visit the places mentioned in Rankin’s books. He mugs a bit while reading passages from the books. Rankin himself tags along with Brown for a while. Did the tourists even recognize him? I wasn’t certain. But I was sold on the attractions of Ediburgh. I’d be willing to check it out! Wednesday, March 25, 2015, 6:30 p.m., at Grande Bibliothèque de BAnQ – Auditorium, 475 de Maisonneuve Blvd E.
The Festival International du Film sur l’Art, known as FIFA, runs until Sunday, March 29, 2015. Visit the web site http://www.artfifa.com for more information.